We have already shared steps for installing Widows XP and Windows Vista on Mac OS X leopard using Boot camp . Now here we will deal with Windows 7 installation on Mac OS X . 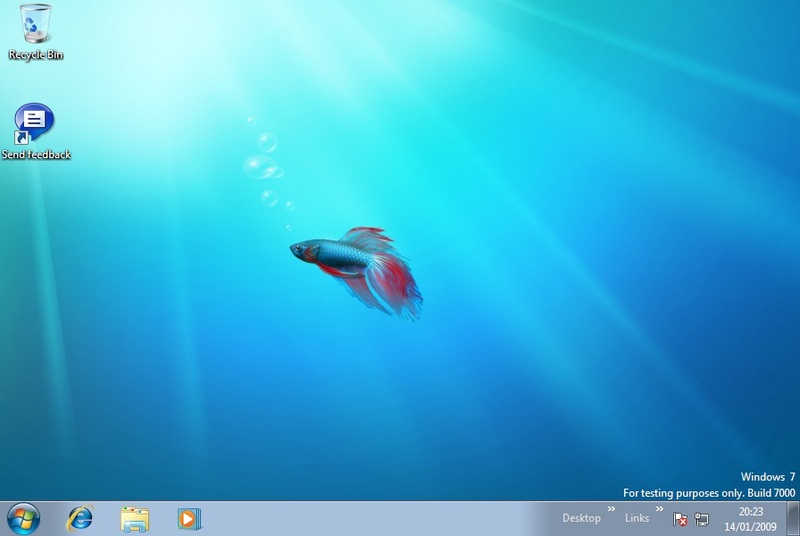 Windows 7 is a very promising OS from Microsoft with lot of features and applications .As Apple hardware now uses Intel processors , we can run Windows 7 on Apple systems and can make use of those wide variety applications .Check out how you can install Windows 7 with Mac OS X using Boot camp . Requirements for Windows 7 installation on MAC OS X Leopard . Mac with enough space ( at least 15GB) for Windows 7 installation. Windows 7 installation on Mac OS X . 1. On your Mac OS X leopard , navigate to applications utilities and the Boot camp manger . 3. Now we will partition hard disk space for Windows 7 . In Boot camp manger interface , you will see a slider as shown below . 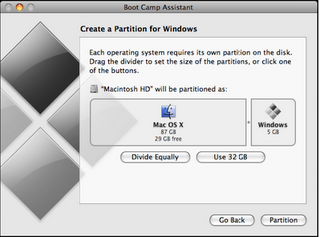 Maintain enough space for Mac OS X by setting Windows 7 partition in the range of 10-15-25 GB . Windows OS installation will take 4.5 GB and rest of space can be used for 3rd party software installation . 4 .Click on to partition . 5. Boot camp icon will appear on your OS X desktop , if partition was successful . 6. Insert your Windows 7 DVD and click on start installation. 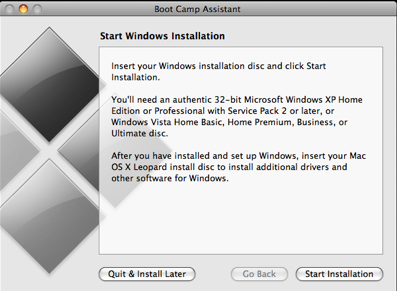 The latest version of Boot camp was introduced for installing Windows Vista on Mac OS X Leopard . So you won’t be able to see Windows 7 in the list . 7. 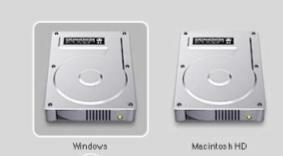 Now your Mac will reboot with Windows 7 and will display those available partitions . 8. Select Boot camp partition and click on format . 9 . Now Windows 7 starts installation . 10 .After installation it will reboot . Remove Windows 7 DVD exactly at this point . 11. Now you will be booted into Windows 7 installation and here you can select language ,time zone , display and many other properties . 12. Insert Mac OS X DVD for installation of device drivers . Boot camp installer will launch and here select to install Apple software update for Windows . 13. Connect to internet ,download video card or other missing drivers and Windows 7 updates . 14.Finally restart after complete installation . 15. Press options key while on restart .You will see these multiple boot choices for OS X and Windows 7 . Download latest version of Boot camp to Install Windows 7 with Mac OS X leopard .